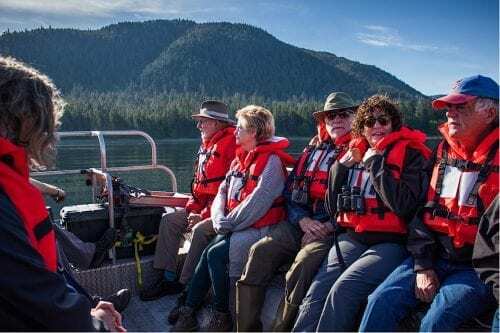 ABOARD THE CHICHAGOF DREAM – Our second and final day in Glacier Bay. Seating on this cruise for meals is not assigned. This simple informality facilitates the social aspect of this cruise; getting to fellow passengers. It’s also nice that the expeditionleaders take turns sharing meals with passengers. For lunch today, we sat with a couple from England, Ken and Sue. 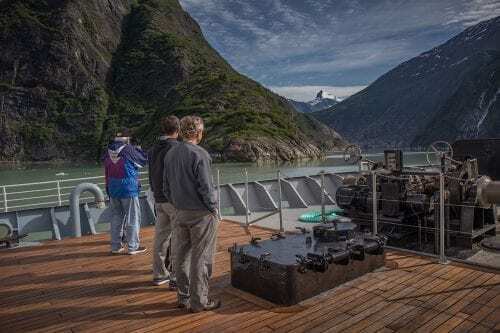 We docked at Bartlett Cove for a tour of the Glacier Bay National Park Visitor’s Center. A gentle cold rain was falling. The water here is a deep emerald green dotted with long golden strands of kelp. Although it rains a lot here in Alaska, it’s no problem because the company arranged for us to have rain gear in our cabins. The boots provided are very comfortable and a nice alternative to getting your footwear soaked. As we started to walk on the trail, I noticed a small animal lumbering toward us. I was certain it was a small scruffy dog but as it walked closer toward us, I noticed that it was a porcupine! It didn’t seem to be bothered by us at all and he disappeared into the dark undergrowth of a spruce tree. A few of us reluctantly spent our time at the lodge connecting to the outside world. With only moments to spare before we had to head back to the boat, we quickly walked down to take a look at a whale skeleton and marveled at its enormous size. Walking back along the trail, I gulped up the enormous diversity of plant life in this rainforest ecosystem. There is a sense of peace in the stillness of the rain falling gently in this place. As we sailed away from Bartlett Cove, we gathered for dinner. Outside we started to notice that the seascape was dotted with sea otters floating on kelp patches. Their heads appeared and disappeared beneath the surface. 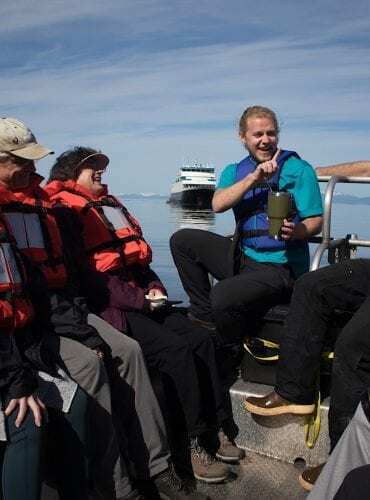 Just as Maggie, one of our expedition leaders, began a presentation on trees of Alaska, someone spotted a whale just off the port side of the vessel. Naturally, everyone jumped up and ran to the window to spot the whale. The company provides plenty of binoculars in the forward lounge and cabins. Sure enough, off in the distance, near the rocky shoreline, we spotted several whale spouts. The group was very enthusiastic and excited to enjoy yet another moment of this majestic wilderness. Back to Maggie’s presentation but then the whales were spotted again. Back to the window! Now, a crew member announced that a mama brown bear and two cubs were spotted in the tall grass on the shore just off the starboard side of the vessel. Everyone who wasn’t already looking outside for whales was looking now for bears! I went outside on the bow to have a better look. I looked through the large telescope and saw them frolicking in the tall grass. After a long and eventful day, we are all looking forward to tomorrow’s trip to Whitestone Harbor to kayak again.